Oh Paris you were an absolute dream! We honestly would not have come home if we didn’t have our sweet hubbys waiting for us. It was hard to return to the reality of no Crepe stands every few feet & warm French Baguettes waiting just around every corner. The food, the cafes, the beautiful doors & apartments, the architecture & dont even get me started on the Eiffel Tower! It was the perfect girls trip & another one is already in the making, we just can’t get enough of beautiful Paris, France! We could go there a million times & never get tired of the Eiffel Tower sparkling at night, its simply breath taking. Lets have a conversation about Macaroons really quick, I mean my taste buds are watering just thinking about those lovely little treats & they are just as pretty to look at, believe me its a win win! We had a wonderful time to say the least & we are so excited to share a few of our favorite pictures with y’all! ” A tulle skirt is ALWAYS a good idea,” & Bliss Tulle, you have done it again! Oh my heart the Orchid & the Ella skirts were nothing short of perfection. The Eiffel Tower & Tulle were just made for each other don’t you think? It was our dream to twirl around in tulle in Paris and oh my goodness it was better than we could have ever imagined! 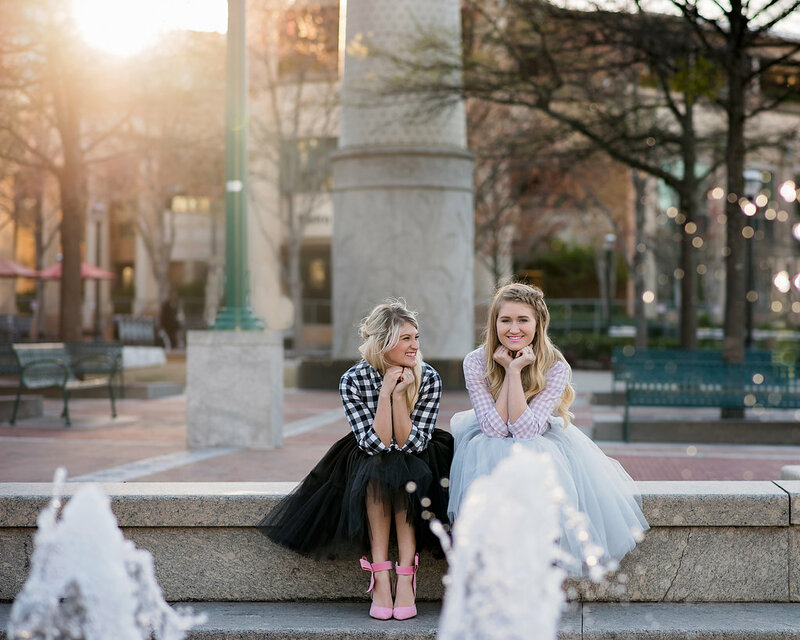 Best friends+Bliss Tulle Skirts, + the Eiffel tower make for 1000 pictures that we were delighted to sort through! So all of you with a trip to Paris in your future make sure to go to the Trocadero at sunrise for the best picture of the Eiffel Tower! It is absolutely stunning! The lighting is perfect + its the only time of day you can get the picture you want with no other tourist in the background. Parisians are not early risers and there was literally nobody around except a few other photographers with the same idea as us, it was perfect & a must do on your next trip to Paris! Another quick tid bit, if you are going to be in Paris for more than 2 days GET THE PARIS PASS! It will save you quite a bit of money + you get to skip all of the lines & go straight to the front, which i promise is well worth it especially at The Louvre! Don’t be afraid to take the metro, once you learn what direction you need to go its pretty easy to navigate & so much cheaper than a taxi! Plus if you get the metro pass its 28 Euro for the week & you get to use it on the metro, bus & tram, in other words a definite money saver! But don’t forget to print off a picture of yourself before you leave, they put it on your metro card, and it becomes your id for the week. It was lovely to see all the photos and to read about your wonderful experience.